A Light Meter is a device that can measure the amount or quality of light as it relates to the camera settings and exposure of the film emulsion of digital image sensor. Light meters come in three basics types: Incident Meter, Spot Meter and Color Meter. Measuements are displayed in f-Stops, LUX, Footcandles and Kelvin Temperature readings. 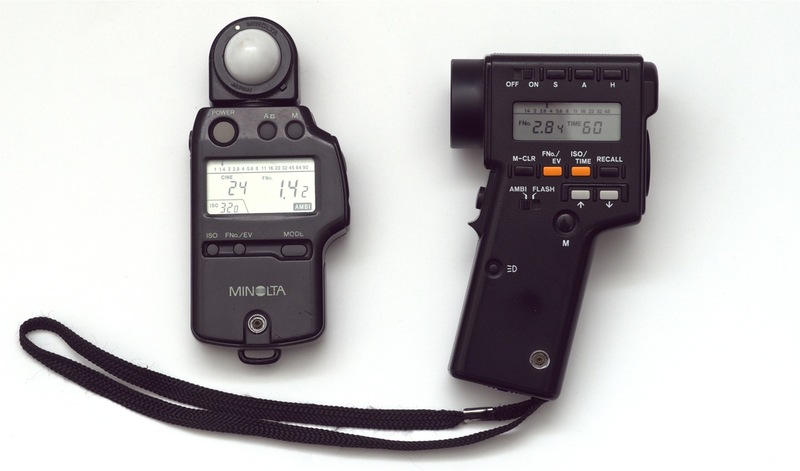 Some types of light meters such as the Sekonic model shown at right are a combination of two types of meters. The meter pictured has a dial that is twisted to set the meter into 'incidence mode'. An incident light reading is taken at the fixed position of subject distance from camera and light source. The triangulated location of the incident light meter reading is a critical position that must be done precisely in the vicinity of where the camera subject is receiving light from a lighting source. The reading on the meter is intended to tell the camera operator what the aperture should be opened or closed to for correct exposure. The light meter has an internal setting so that it's ASA/ISO light sensitivity setting is the same as the camera (either the film stock ASA speed or the digital camera ISO sensitivity settting). If the incident reading is made further away from the subject or the light source the reading will be too low. If the reading is made closer to the light source the reading will be too high as the subject is further away from the light. Another setting of the combination light meter is the Spot meter. A spot reading is useful as it tells exactly what amount of light is being reflected off the subject directly into the camera lens.